I remember advertising this course to my colleagues via the University Email list, and on my blog, sometime on May 25, 2017 (view advert link). I am glad a good number of University of Nigeria staff participated in the course. This is the 3rd ASIRA course held in 2017. ASIRA (Access to Scientific Information Resources in Agriculture) is an online course for low-income countries delivered by the Food and Agriculture Organization of the United Nations (FAO) in collaboration with Research4Life. 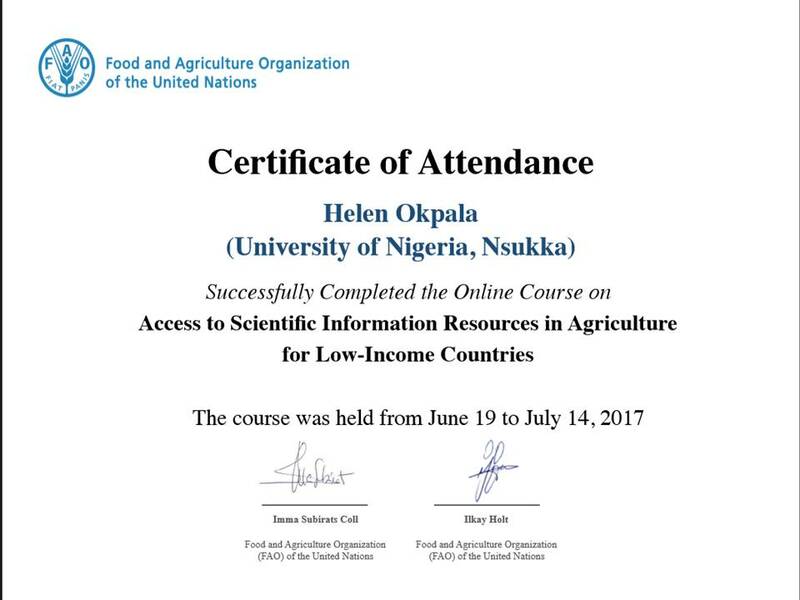 The goal of the online course is to provide a platform to enhance the visibility, accessibility and usability of agricultural data and science particularly in low-income countries. It is designed specifically to serve the needs of researchers, librarians and even students who are operating in agricultural sciences from nutrition to fisheries in becoming familiar with academic publishing landscape, latest trends, and using scholarly information resources efficiently including the legal aspect of the field. It was first announced in January 2017 and performed first time from 13th February and 10th March. As a Librarian, I decided to participate in the course so as to learn about research in Agriculture and the basics of research, copyright and information sourcing. Just today, I got my certificate (See below), yay! I can boldly say that I am better equipped with new skills and ready to impact my immediate and online community, and beyond.